This article is about the history of Serbia in general, from the earliest historical times to the present day. For history of the Serbs in general, see History of the Serbs. The history of Serbia covers the historical development of Serbia and of its predecessor states, from the early Stone Age to the present state, as well as that of the Serbian people and of the areas they ruled historically. The scope of Serbian habitation and rule has varied much through the ages, and, as a result, the history of Serbia is similarly elastic in what it includes. 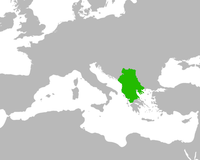 Slavs settled the Balkans in the 6th and 7th centuries, out of which settlement the First Serbian Principality of the Vlastimirovići emerged. It evolved into a Grand Principality by the 11th century, and in 1217 the Kingdom and national church (Serbian Orthodox Church) were established, under the Nemanjići. In 1345 the Serbian Empire was established: it spanned a large part of the Balkans. In 1540 the Ottoman Empire annexed Serbia. The Serbian realms disappeared by the mid-16th century, torn by domestic feuds and overcome by Ottoman conquest. The success of the Serbian revolution against Ottoman rule in 1817 marked the birth of the Principality of Serbia, which achieved de facto independence in 1867 and finally gained recognition by the Great Powers in the Berlin Congress of 1878. 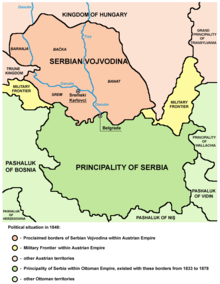 As a victor in the Balkan Wars of 1912-1913, Serbia regained Vardar Macedonia, Kosovo and Raška (Old Serbia). 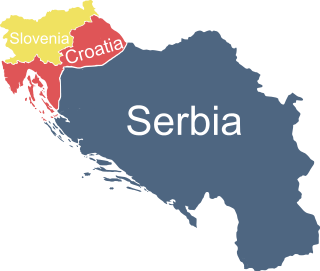 In late 1918 the region of Vojvodina proclaimed its secession from Austria-Hungary to unite with the pan-Slavic State of Slovenes, Croats and Serbs; the Kingdom of Serbia joined the union on 1 December 1918, and the country was named the Kingdom of Serbs, Croats, and Slovenes. Serbia achieved its current borders at the end of World War II, when it became a federal unit within the Federal People's Republic of Yugoslavia (proclaimed in November 1945). After the dissolution of Yugoslavia in a series of wars in the 1990s, Serbia once again became an independent state on 5 June 2006, following the breakup of a short-lived union with Montenegro. The Paleo-Balkan tribes evolved in the 2nd and 1st millennia BC. The northernmost Ancient Macedonian city was in south Serbia (Kale-Krševica). The Celtic Scordisci tribe conquered most of Serbia in 279 BC, building many forts throughout the region. The Roman Empire conquered the region in the span of 2nd century BC – 1st century AD. The Romans continued the expansion of Singidunum (modern capital Belgrade), Sirmium (Sremska Mitrovica) and Naissus (Niš), among other centres, and a few notable remnants of monuments survive, such as Via Militaris, Trajan's Bridge, Diana, Felix Romuliana (UNESCO), etc. Northern parts were included in Moesia Superior, Dacia Remesiana and Dacia Mediterranea. Serbia's strategic location between two continents has subjected it to invasions by many peoples. Greeks colonized its south in the 11th century BC, the northernmost point of the empire of Alexander the Great being the town of Kale-Krsevica. The Thracians dominated Serbia before the Illyrian migration in the southwest. Greeks colonized the south in the 4th century BC, the northernmost point of the empire of Alexander the Great being the town of Kale. The Romans conquered parts of Serbia in the 2nd century BC, in 167 BC when conquering the West, establishing the province of Illyricum and the rest of Central Serbia in 75 BC, establishing the province of Moesia. Srem was conquered by 9 BC and Bačka and Banat in 106 AD after the Trajan's Dacian Wars. Seventeen Roman Emperors were born in present-day Serbia. Belgrade is believed to have been torn by 140 wars since Roman times. The Serbs in the Byzantine world lived in the so-called Slav lands, lands initially out of Byzantine control and independent. The Vlastimirović dynasty established the Serbian Principality in the 8th century. In 822, the Serbs "inhabited the greater part of Dalmatia", and Christianity was adopted as the state religion in c. 870. In the mid-10th century the state had emerged into a tribal confederation that stretched to the shores of the Adriatic Sea by the Neretva, the Sava, the Morava, and Skadar.In 924, the Serbs ambushed and defeated a small Bulgarian army, provoking a major retaliatory campaign that ended with Bulgaria's annexation of Serbia at the end of that year.Threatened by an alliance between the Byzantines and the Serbian state of Duklja, in 997 the Bulgarian tsar Samuel defeated and captured its Prince Jovan Vladimir and took control of the Serb lands again.The state disintegrated after the death of the last known Vlastimirid ruler; the Byzantines annexed the region and held it for a century, until 1040 when the Serbs under the leadership of what would become the Vojislavljević dynasty revolted in Duklja, a maritime region. In 1091, the Vukanović dynasty established the Serbian Grand Principality, based in Raška (Rascia). The two-halves were reunited in 1142. In 1166, Stefan Nemanja assumed the throne, marking the beginning of a prospering Serbia, henceforth under the rule of the Nemanjić dynasty. Nemanja's son Rastko (posth. Saint Sava), gained autocephaly for the Serbian Church in 1219 and authored the oldest known constitution, and at the same time Stefan the First-Crowned established the Serbian Kingdom. Medieval Serbia reached its peak during the reign of Stefan Dušan (1331-1355), who took advantage of the Byzantine civil war and doubled the size of the state by conquering territories to the south and east at the expense of Byzantium, reaching as far as the Peloponnese, also being crowned Emperor of Serbs and Greeks in 1346. The Battle of Kosovo against the rising Ottoman Empire in 1389 marks a turning point and is considered as a beginning of the fall of the medieval Serbian state. The magnate families Lazarević and Branković ruled the suzerain Serbian Despotate afterwards (in the 15th and 16th centuries). After the fall of Constantinople to the Ottomans in 1453 and the Siege of Belgrade, the Serbian Despotate fell in 1459 following the siege of the provisional capital of Smederevo. By 1455, central Serbia was completely conquered by the Ottoman Empire. After repelling Ottoman attacks for over 70 years, Belgrade finally fell in 1521, opening the way for Ottoman expansion into Central Europe. Vojvodina, which was inhabited by Hungarians, resisted Ottoman rule until well into the 16th century. Medieval Bosnia and Zeta lasted until 1496. A Serbian principality was restored a few years after the fall of the Serbian Despotate by the Brankovics. It was ruled by exiled Serbian nobles and existed until 1540 when it fell to the Ottomans. From the 14th century onward an increasing number of Serbs began migrating to the north to the region today known as Vojvodina, which was under the rule of the Kingdom of Hungary in that time. The Hungarian kings encouraged the immigration of Serbs to the kingdom, and hired many of them as soldiers and border guards. During the struggle between the Ottoman Empire and Hungary, this Serb population performed an attempt of the restoration of the Serbian state. In the Battle of Mohács on 29 August 1526, Ottoman Empire destroyed the Hungarian army and made Hungary its subject. Soon after the battle, the leader of Serbian mercenaries in Hungary, Jovan Nenad, established his rule in what is now Vojvodina. He created an ephemeral independent state, with Subotica as its capital. King John of Hungary defeated Jovan Nenad in 1527. European powers, and Austria in particular, fought many wars against the Ottoman Empire, sometimes with assistance from Serbs. During the Austrian–Ottoman War (1593–1606), in 1594, some Serbs participated in an uprising in Banat—the Pannonian part of the Ottoman Empire, and Sultan Murad III retaliated by burning the relics of St. Sava. Austria established troops in Herzegovina but when peace was signed by Ottoman Empire and Austria, Austria abandoned to Ottoman vengeance. This sequence of events became customary for the centuries that followed. During the Great War (1683–90) between the Ottoman Empire and the Holy League—created with the sponsorship of the Pope and including Austria, Poland and Venice—these three powers as means of divide and conquer strategy, incited including Serbs to rebel against the Ottoman authorities and soon uprisings and terrorism spread throughout the western Balkans: from Montenegro and the Dalmatian Coast to the Danube basin and Old Serbia (Macedonia, Raška, Kosovo and Metohija). However, when the Austrians started to pull out of the Ottoman region, they invited Austrian-loyal people to come north with them into Hungarian territories. Having to choose between Ottoman reprisal or living in Hungary, some Serbs abandoned their homesteads and headed north led by patriarch Arsenije Čarnojević. Another important episode in the history of the region took place in 1716–18, when the territories ranging from Dalmatia, and Bosnia and Herzegovina to Belgrade and the Danube basin became the battleground for a new Austria-Ottoman war launched by Prince Eugene of Savoy. Some Serbs sided once again with Austria. After a peace treaty was signed in Požarevac, the Ottomans lost all its possessions in the Danube basin, as well as today's northern Serbia and northern Bosnia, parts of Dalmatia and the Peloponnesus. Serbia gained its autonomy from the Ottoman Empire in two uprisings in 1804 (led by Đorđe Petrović – Karađorđe) and 1815 (led by Miloš Obrenović), although Turkish troops continued to garrison the capital, Belgrade, until 1867. The Turkish Empire was already faced with a deep internal crisis without any hope of recuperating. This had a particularly hard effect on the orthodox nations living under its rule. The Serbs launched not only a national revolution but a social one as well. The Autonomous Principality became an internationally recognized independent country following the Russo-Turkish War in 1878. Serbia remained a principality or kneževina (knjaževina), until 1882 when it became a Kingdom, during which the internal politics revolved largely around dynastic rivalry between the Obrenović and Karađorđević families. This period was marked by the alternation of two dynasties descending from Đorđe Petrović—Karađorđe, leader of the First Serbian Uprising and Miloš Obrenović, leader of the Second Serbian Uprising. Further development of Serbia was characterized by general progress in economy, culture and arts, primarily due to a wise state policy of sending young people to European capitals to get an education. They all brought back a new spirit and a new system of values. One of the external manifestations of the transformation that the former Turkish province was going through was the proclamation of the Province of Serbia in 1882. During the Revolutions of 1848, the Serbs in the Austrian Empire proclaimed Serbian autonomous province known as Serbian Vojvodina. By a decision of the Austrian emperor, in November 1849, this province was transformed into the Austrian crown land known as the Voivodeship of Serbia and Temes Banat (Dukedom of Serbia and Tamiš Banat). Against the will of the Serbs, the province was abolished in 1860, but the Serbs from the region gained another opportunity to achieve their political demands in 1918. Today, this region is known as Vojvodina. In 1885, Serbia was against the unification of Bulgaria and Eastern Rumelia and attacked Bulgaria. This is also known as Serbo-Bulgarian War. Despite better weapons and skilled commanders, Serbia lost the war. In the second half of 19th century, Serbia gained statehood as the Kingdom of Serbia. It thus became part of the constellation of European states and the first political parties were founded, thus giving new momentum to political life. The May Coup in 1903, bringing Karađorđe's grandson to the throne with the title of King Peter I, opened the way for parliamentary democracy in Serbia. Having received a European education, this liberal king translated "On Liberty" by John Stuart Mill and gave his country a democratic constitution. It initiated a period of parliamentary government and political freedom interrupted by the outbreak of the liberation wars. Serbia had multiple national goals. The large number of Serbs living in Bosnia looked to Serbia as the focus of their nationalism, but they were ruled by the Germans of the Austrian Empire. Austria's annexation of Bosnia in 1908 deeply alienated the Serbian peoples. Plotters swore revenge, which they achieved in 1914 by assassination of the Austrian heir. Serbian intellectuals dreamed of a South Slavic state--which in the 1920s became Yugoslavia. Serbia was landlocked, and strongly felt the need for access to the Mediterranean, preferably through the Adriatic Sea. Austria worked hard to block Serbian access to the sea, for example by helping with the creation of Albania in 1912. Montenegro, Serbia's only real ally, did have a small port, but Austrian territory intervened, blocking access until Serbia acquired Novi Pazar and part of Macedonia from Turkey in 1913. To the south, Bulgaria blocked Serbian access to the Aegean Sea. Serbia, Greece, Montenegro and Bulgaria formed the Balkan League and went to war with the Ottomans in 1912-13. They won decisively and expelled that Empire from almost all of the Balkans. The main remaining foe was Austria, which strongly rejected Pan-Slavism and Serbian nationalism and was ready to make war to end those threats. Ethnic nationalism would doom the multicultural Austro-Hungarian Empire. Expansion of Serbia would block Austrian and German aspirations for direct rail connections to Constantinople and the Middle East. Serbia relied primarily on Russia for Great Power support but Russia was very hesitant at first to support Pan-Slavism, and counselled caution. However, in 1914 it reversed positions and promised military support to Serbia. The 28 June 1914 assassination of Austrian Crown Prince Franz Ferdinand in the Bosnian capital Sarajevo, by Gavrilo Princip, a member of Young Bosnia and one of seven assassins, served as a pretext for the Austrian declaration of war on Serbia on 28 July 1914, marking the beginning of World War I, despite Serbia's acceptance three days earlier of nearly all of Austria-Hungary's demands. The Austro-Hungarian army invaded Serbia capturing the capital Belgrade on 2 December 1914, however the Serbian Army successfully defended the country, won several victories, and on 15 December 1914 recaptured Belgrade. In late 1915, however, German generals were given control and invaded Serbia with Austrian and Bulgarian forces. The Serbian army retreated across the Albanian mountain ranges to the Adriatic Sea by January 1916. Only 70,000 made it through to be evacuated to Greece by Italian, French and British naval forces. The Entente promised the territories of Srem, Bačka, Baranja, eastern Slavonia, Bosnia and Herzegovina and eastern Dalmatia to Serbia as a reward after the war. Having recuperated on Corfu the Serbian Army returned to combat on the Thessaloniki front together with other Entente forces. Serbia suffered 1,264,000 casualties—28% of its population of 4.6 million, which also represented 58% of its male population—a loss from which it never fully recovered. A successful Allied offensive in September 1918 secured first Bulgaria's surrender and then the liberation of the occupied Serbian territories (November 1918). On 25 November, the Assembly of Serbs, Bunjevci, and other nations of Vojvodina in Novi Sad voted to join the region to Serbia. Also, on 29 November the National Assembly of Montenegro voted for union with Serbia, and two days later an assembly of leaders of Austria–Hungary's southern Slav regions voted to join the new State of Slovenes, Croats and Serbs. With the end of World War I and the collapse of both the Austro-Hungarian and Ottoman Empires the conditions were met for proclaiming the Kingdom of Serbs, Croats and Slovenes in December 1918. The Yugoslav ideal had long been cultivated by the intellectual circles of the three nations that gave the name to the country, but the international constellation of political forces and interests did not permit its implementation until then. However, after the war, idealist intellectuals gave way to politicians, and the most influential Croatian politicians opposed the new state right from the start. In the early 1920s the Yugoslav government of Serbian prime minister Nikola Pašić used police pressure over voters and ethnic minorities, confiscation of opposition pamphlets and other measures of election rigging to keep the opposition, and mainly the Croatian Peasant Party and its allies in minority in Yugoslav parliament. Pašić believed that Yugoslavia should be as centralized as possible, creating in place of distinct regional governments and identities a Greater Serbian national concept of concentrated power in the hands of Belgrade. However, what pushed the Kingdom into crisis was when a Serb representative opened fire on the opposition benches in the Parliament, killing two outright and mortally wounding the leader of the Croatian Peasants Party, Stjepan Radić in 1928. Taking advantage of the resulting crisis, King Alexander I banned national political parties in 1929, assumed executive power, and renamed the country Yugoslavia. He hoped to curb separatist tendencies and mitigate nationalist passions. However, the balance of power changed in international relations: in Italy and Germany, Fascists and Nazis rose to power, and Joseph Stalin became the absolute ruler in the Soviet Union. None of these three states favored the policy pursued by Alexander I. The first two wanted to revise the international treaties signed after World War I, and the Soviets were determined to regain their positions in Europe and pursue a more active international policy. Yugoslavia was an obstacle for these plans, and King Aleksandar I was the pillar of the Yugoslav policy. During an official visit to France in 1934, the king was assassinated in Marseille by a member of the Internal Macedonian Revolutionary Organization – an extreme nationalist organization in Bulgaria that had plans to annex territories along the eastern and southern Yugoslav border—with the cooperation of the Ustaše – a Croatian fascist separatist organization. The international political scene in the late 1930s was marked by growing intolerance between the principal figures, by the aggressive attitude of the totalitarian regimes. Croatian leader Vlatko Maček and his party managed to extort the creation of the Croatian banovina (administrative province) in 1939. The agreement specified that Croatia was to remain part of Yugoslavia, but it was hurriedly building an independent political identity in international relations. Thus the beginning of the 1940s, Yugoslavia found itself surrounded by hostile countries. Except for Greece, all other neighboring countries had signed agreements with either Germany or Italy. Adolf Hitler was strongly pressuring Yugoslavia to join the Axis powers. The government was even prepared to reach a compromise with him, but the spirit in the country was completely different. Public demonstrations against Nazism prompted a brutal reaction. On 6 April 1941 Germany, Italy, Hungary, and Bulgaria invaded Yugoslavia, and the Luftwaffe bombed Belgrade for 3 days killing 17,000 people. Belgrade was captured by German forces on 13 April 1941, and four days later on 17 April 1941 the Royal Yugoslavian Army surrendered unconditionally. Acting upon advice and with a heavy heart, King Peter II left the country to seek Allied support. He was greeted as the hero who dared oppose Hitler. The Royal Yugoslav Government, the only legal body of Yugoslavia, continued to work in London. The occupying Axis powers then divided Yugoslavia up. The western parts of the country together with Bosnia and Herzegovina were turned into a Nazi puppet state called the Independent State of Croatia (NDH) and ruled by the Ustashe. Most of the territory of modern Serbia was occupied by the German army and was governed by the German Military Administration in Serbia. The governed territory was called Serbia or the Territory of the Military Commander in Serbia, and, besides German military administrators, it was also governed by the Serbian puppet governments first under Milan Aćimović and then under Serbian army general Milan Nedić. The northern territories were annexed by Hungary, and eastern and southern territories by Bulgaria. Kosovo and Metohija were mostly annexed by Albania which was under the sponsorship of fascist Italy. Montenegro also lost territories to Albania and was then occupied by Italian troops. Slovenia was divided between Germany and Italy, which also seized the islands in the Adriatic. The biggest concentration camps were Banjica and Sajmište near Belgrade, where, according to the most conservative estimates, around 40,000 Jews were killed. In all those camps, some 90 percent of the Serbian Jewish population perished. In the Bačka region annexed by Hungary, numerous Serbs and Jews were killed in 1942 raid by the Hungarian authorities. The persecutions against ethnic Serb population also occurred in the region of Syrmia, which was controlled by the Independent State of Croatia and in the region of Banat, which was under direct German control. The ruthless attitude of the German occupation forces and the genocidal policy of the Croatian Ustaša regime, aimed at Serbs, Jews, Gypsies and anti-Ustaša Croats, created a strong anti-fascist resistance in the NDH. Many Croats and other nationalities stood up against the genocide and the Nazis. Many joined the Partisan forces created by the Communist Party (National Liberation Army headed by Josip Broz Tito) in the liberation and the revolutionary war against Nazis and all the others who were against communism. During this war and after it, the Partisans killed many civilians who did not support their Communist ideals. The Communists shot people without trials, or following politically and ideologically motivated courts, such as in the case of Draža Mihailović, leader of the Chetniks. The Agricultural Reform conducted after the war meant that peasants had to give away most of their wheat, grain, and cattle to the state, or face serious imprisonment. Land and property were confiscated on a massive scale. Many people also lost civil rights and their names were smeared. Also, a censorship was enforced on all levels of the society and media, and a cult of Tito was created in the media. After the war, Josip Broz Tito became the first president of the new—socialist—Yugoslavia which he ruled through the League of Communists of Yugoslavia. Once a predominantly agricultural country, Yugoslavia was transformed into a mid-range industrial country, and acquired an international political reputation by supporting the decolonization process and by assuming a leading role in the Non-Aligned Movement. 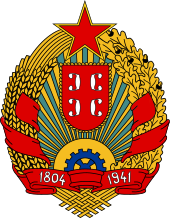 Socialist Yugoslavia was established as a federal state comprising six republics, from north to south: Slovenia, Croatia, Bosnia and Herzegovina, Serbia, Montenegro and Macedonia and two autonomous regions within Serbia – Vojvodina and Kosovo. The basic motto of Tito's Yugoslavia was "brotherhood and unity", workers' self-management, state-owned property with minimal privately owned property. In the beginning, the country copied the Soviet model, but after the 1948 split with the Soviet Union, it turned more towards the West. Eventually, it created its own brand of socialism, with aspects of a market economy, and milked both the East and the West for significant financial loans. When Tito died on 4 May 1980, he was succeeded by a presidency that rotated annually between the six Republics and two Autonomous Regions. This led to a fatal weakening of central power and ties between the republics. During the 1980s the republics pursued significantly different economic policies, with separatist- oriented Slovenia and Croatia allowing significant market-based reforms, while Serbia kept to its existing program of state ownership. This, too, was a cause of tension between north and south, as Slovenia in particular experienced a period of strong growth. Prior to the war, inflation skyrocketed. Then, under Prime Minister Ante Markovic, things began to improve. Economic reforms had opened up the country, the living standard was at its peak, capitalism seemed to have entered the country and nobody thought that just a year later the first gunshots would be fired. Within a year of Tito's death the first cracks began to show when in the spring of 1981 when on 11 March, 26 March, and 31 March to 2 April an escalating series of increasingly large protests spread from the campus of the University of Pristina to the streets of several cities in Kosovo demanding the upgrading of the Autonomous Region to the status of full Republic – these protests were violently suppressed by the Police with many deaths, and a state of emergency was declared. Serbian concerns about the treatment of Serb minorities in other republics and particularly in Kosovo were exacerbated by the SANU Memorandum, drawn up by the Serbian Academy of Sciences and Arts and published in Sep 1986 byVečernje novosti, which claimed that Serbs were suffering a genocide at the hands of the Kosovo Albanian majority. Slobodan Milošević leader of the League of Communists of Serbia since May 1986, became the champion of the Serbian Nationalists when on 24 Apr 1987 he visited Kosovo Polje and, after local Serbs had clashed with the Police declared, 'No one has the right to beat you'. Slobodan Milošević became the most powerful politician in Serbia on 25 Sep 1987 when he defeated and humiliated his former mentor Serbian President Ivan Stambolic, during the televised 8th Session of the League of Communists of Serbia. Milosevic governed Serbia from his position as Chairman of the Central Committee of the League of Communists of Serbia until 8 May 1989 when he assumed the Presidency of Serbia. Milosevic supporters gained control of three other constituent parts of Yugolslavia in what became known as the Anti-bureaucratic revolution, Vojvodina on 6 Oct 1988, Kosovo on 17 Nov 1988, and Montenegro on 11 Jan 1989. On 25 Nov 1988 the Yugoslav National Assembly granted Serbia the right to change its constitution. In March 1989 this was done, removing autonomy from Vojvodina and Kosovo, which caused great unrest in Kosovo On 28 June 1989 Slobodan Milošević made what became known as the Gazimestan Speech which was the centrepiece of a day-long event, attended by an estimated one million Serbs, to mark the 600th anniversary of the Serbian defeat at the Battle of Kosovo by the Ottoman Empire. In this speech Milošević's reference to the possibility of "armed battles" in the future of Serbia's national development was seen by many as presaging the collapse of Yugoslavia and the bloodshed of the Yugoslav Wars. On 23 Jan 1990 at its 14th Congress the Communist League of Yugoslavia voted to remove its monopoly on political power, but the same day effectively ceased to exist as a national party when the League of Communists of Slovenia walked out after Slobodan Milošević blocked all their reformist proposals. On 27 July 1990 Milošević merged the League of Communists of Serbia with several smaller communist front parties to form the Socialist Party of Serbia. A new Constitution was drawn up and came into force on 28 Sep 1990 transforming the one-party Socialist Republic of Serbia into a multi-party Republic of Serbia The first multi-party elections were held on 9 and 23 December 1990 and in what became the pattern for the next several elections the Socialist Party of Serbia won, as Milošević maintained firm control over the state media and opposition parties had little access. On 9 March 1991 a mass rally on the streets of Belgrade turned into a riot with vicious clashes between the protesters and police. It was organized by Vuk Drašković's Serbian Renewal Movement (SPO). Two people died in the ensuing violence. The Socialist Federal Republic of Yugoslavia broke up in 1991/1992 in a series of wars following the independence declarations of Slovenia and Croatia on 25 Jun 1991, and Bosnia and Herzegovina on 5 Mar 1992. Macedonia left the federation peacefully on 25 Sep 1991. The Yugoslav People's Army(JNA) tried and failed to prevent the secession of Slovenia in the Ten Day War 26 Jun – 6 Jul 1991 and completely withdrew by 26 Oct 1991. The JNA attempted and failed to prevent the secession of Croatia during the first phase of the Croatian War of Independence from 27 Jun 1991 until the truce of Jan 1992, but did successfully enable the Croatian Serb minority to establish the Republic of Serb Krajina which looked to Serbia for support. The biggest battle of this war was the Siege of Vukovar. Following the start of the Bosnian War on 1 April 1992 the JNA officially withdrew all its forces from Croatia and Bosnia in May 1992 and was formally dissolved on 20 May 1992 – its remnant forces being taken over by the new Federal Republic of Yugoslavia. The two remaining republics of Yugoslavia, Serbia and Montenegro, formed on 28 April 1992 a new federation named Federal Republic of Yugoslavia. Following the breakup of Yugoslavia, the Federal Republic of Yugoslavia (FRY) was established in 1992 as a federation. In 2003, it was reconstituted as a political union called the State Union of Serbia and Montenegro (SCG). After June 1999, Kosovo was made a United Nations protectorate, under the UN Mission in Kosovo (UNMIK) based in Priština. From early 2001, UNMIK has been working with representatives of the Serbian and union governments to reestablish stable relations in the region. A new assembly of the province was elected in November 2001, which formed a government and chose a president in February 2002. In spring 2002, UNMIK announced its plan to repatriate ethnic Serb internally displaced persons (IDPs). Although threatened by Milošević throughout the last years of his rule, Montenegro's democratization efforts have continued. In January 1998, Milo Đukanović became Montenegro's president, following bitterly contested elections in November 1997, which were declared free and fair by international monitors. His coalition followed up with parliamentary elections in May. Having weathered Milošević's campaign to undermine his government, Đukanović has struggled to balance the pro-independence stance of his coalition with the changed domestic and international environment of the post-5 October Balkans. In December 2002, Đukanović resigned as president and was appointed Prime Minister. The new President of Montenegro is Filip Vujanović. Before 5 October, even as opposition grew, Milošević continued to dominate the organs of the Federal Republic of Yugoslavia (FRY) Government. And although his political party, the Socialist Party of Serbia (SPS) (in electoral cartel with Mirjana Markovic' Yugoslav United Left), did not enjoy a majority in either the federal or Serbian parliaments, it dominated the governing coalitions and held all the key administrative posts. An essential element of Milošević's grasp on power was his control of the Serbian police, a heavily armed force of some 100,000 that was responsible for internal security and which committed serious human rights abuses. Routine federal elections in September 2000 resulted in Kostunica receiving less than a majority, requiring a second round. Immediately, street protests and rallies filled cities across the country as Serbs rallied around Vojislav Koštunica, the recently formed Democratic Opposition of Serbia (DOS, a broad coalition of anti-Milošević parties) candidate for FRY president. There had been widespread fear that the second round would be cancelled on the basis of foreign interference in the elections. Cries of fraud and calls for Milošević's removal echoed across city squares from Subotica to Niš. The new FRY President Vojislav Koštunica was soon joined at the top of the domestic Serbian political scene by the Democratic Party's (DS) Zoran Đinđić, who was elected Prime Minister of Serbia at the head of the DOS ticket in December's republican elections. After an initial honeymoon period in the wake of 5 October, DSS and the rest of DOS, led by Đinđić and his DS, found themselves increasingly at odds over the nature and pace of the governments' reform programs. Although initial reform efforts were highly successful, especially in the economic and fiscal sectors, by the middle of 2002, the nationalist Koštunica and the pragmatic Đinđić were openly at odds. Koštunica's party, having informally withdrawn from all DOS decision-making bodies, was agitating for early elections to the Serbian Parliament in an effort to force Đinđić from the scene. After the initial euphoria of replacing Milošević's autocratic regime, the Serbian population, in reaction to this political maneuvering, was sliding into apathy and disillusionment with its leading politicians by mid-2002. This political stalemate continued for much of 2002, and reform initiatives stalled. In February 2003, the Constitutional Charter was finally ratified by both republics, and the FRY Parliament and the name of the country was changed from Federal Republic of Yugoslavia to Serbia and Montenegro. Under the new Constitutional Charter, most federal functions and authorities devolved to the republic level. The office of President of the Federal Republic of Yugoslavia, held by Vojislav Koštunica, ceased to exist once Svetozar Marović was elected President of Serbia and Montenegro. On 12 March 2003, Serbian Prime Minister Zoran Đinđić was assassinated. The newly formed union government of Serbia and Montenegro reacted swiftly by calling a state of emergency and undertaking an unprecedented crackdown on organized crime which led to the arrest of more than 4,000 people. Parliamentary elections were held in the Republic of Serbia on 28 December 2003. Serbia had been in a state of political crisis since the overthrow of the post-communist ruler, Slobodan Milošević, in 2001. The reformers, led by former Yugoslav President Vojislav Koštunica, have been unable to gain control of the Serbian presidency because three successive presidential elections have failed to produce the required 50% turnout. The assassination in March 2003 of the reforming Prime Minister, Zoran Đinđić was a major setback. Despite the great increase in support for the Radicals, the four pro-reform parties (Koštunica's Democratic Party of Serbia, late Prime Minister Đinđić's Democratic Party, now led by Boris Tadić, and the G17 Plus group of liberal economists led by Miroljub Labus, plus the SPO-NS) won 49.8% of the vote, compared with 34.8% for the two anti-western parties, the Radicals of Vojislav Šešelj and the Socialists of Milošević, and won 146 seats to 104. At the 2004 Presidential election Boris Tadić, candidate of the Democratic Party won over Tomislav Nikolić, of the Serbian Radical Party, sealing the future reform and EU-integration path of Serbia. Since 1996, Montenegro began to sever economic ties with Serbia as it formed a new economic policy and adopted the Deutsche Mark as its currency. Subsequent governments of Montenegro carried out pro-independence policies, and political tensions with Serbia simmered despite political changes in Belgrade. Also, separatist Albanian paramilitaries began a steady escalation of violence in 1998. The question whether the Federal Yugoslav state would continue to exist became a very serious issue to the government. A referendum was held on 28 and 29 October 2006 on a proposed draft of the new Constitution of Serbia, which was approved. The constitution is Serbia's first as an independent state since the Kingdom of Serbia's 1903 constitution. The 2007 elections confirmed the pro-reform and pro-European stance of the Serbian Parliament, in which Boris Tadic's party doubled his representation. On 3 February 2008, Tadic was re-elected as President. The Serbian government passed through weeks of severe crisis after the unilateral declaration of independence of its southern province of Kosovo on 17 February 2008, which was gradually recognized by the United States and numerous European Union countries. The crisis was fuelled by the demand by Prime Minister Vojislav Koštunica of the Democratic Party of Serbia (DSS) to the Democratic Party (Serbia) (DS), which held governmental majority, of a restructuring of the governmental contract including an annex according to which Serbia can continue European integration exclusively with Kosovo as its integral part, as stated in the 2006 Constitution. The DS and G17+ refused, and Koštunica had to resign on 8 March 2008, while also asking the President to dismiss the parliament and schedule pre-term parliamentary elections. These pre-term parliamentary elections were held on 11 May 2008, barely a year after the previous parliamentary election. The results showed a net increase of votes for Tadic's ZES coalition, passing from 87 to 102 seats. After long and difficult negotiations, a new pro-European government was formed on 7 July 2008 by 128 out of 250 parliamentary votes of ZES, SPS-PUPS-JS and 6 out of 7 minorities representatives. The new prime minister was Mirko Cvetković, candidate of the Democratic Party. In 2017, Aleksandar Vučić was elected as President of Serbia. Vučić has a good understanding with the Russian President Putin whom he reveres as Slavic brother, but by 2018 he had also established good relations with the European Union, especially with the German Chancellor Angela Merkel. On 17 February 2008, the Kosovo parliament unilaterally proclaimed independence from Serbia to mixed international reactions. The declaration was officially recognized by the U.S., Austria, Great Britain, Germany, France, Turkey and dozen other countries. Serbia, Russia, China, Spain, India, Brazil, Greece, Romania and other countries oppose this declaration and consider it illegal. In July 2010, the United Nations International Court of Justice deemed the declaration of independence legal. Kosovo officials plan a 2011 application to the UN. Serbia officially applied for European Union membership on 22 December 2009. A Stabilisation and Association Agreement (SAA) was signed in 2008 and entered into force on 1 September 2013. ^ Nikola Tasić; Dragoslav Srejović; Bratislav Stojanović (1990). "Vinča and its Culture". In Vladislav Popović (ed.). Vinča: Centre of the Neolithic culture of the Danubian region. Smiljka Kjurin (translator). Belgrade. Archived from the original on 16 January 2009. Retrieved 28 October 2006. ^ "History (Ancient Period)". Official website. Archived from the original on 28 March 2012. Retrieved 10 July 2007. ^ Kitson, Peter (1999). Year's Work in English Studies Volume 77. Wiley-Blackwell. p. 5. ISBN 978-0-631-21293-5. Retrieved 5 May 2009. ^ a b "Blic Online - Najseverniji grad Aleksandrovog carstva". Blic Online. Archived from the original on 21 August 2009. ^ "Southern Pannonia during the age of the Great Migrations - Hrčak – Scrinia Slavonica, Vol.2 No.1 Listopad". srce.hr. 2002. Archived from the original on 7 February 2012. ^ Scurlock, Gareth (28 July 2008). "Serbia shines for the EXIT festival". The Times. London. Retrieved 4 May 2010. ^ Ćirković 2004, p. 15-17. ^ Ćirković 2004, p. 31-33. ^ Ćirković 2004, p. 40-44. ^ Ćirković 2004, p. 64-65. ^ Ćirković 2004, p. 84-85. ^ Ćirković 2004, p. 107-108. ^ Ćirković 2004, p. 115. ^ Bernadotte E. Schmitt (1937). The Annexation of Bosnia, 1908-1909. Cambridge UP. p. vii. ^ Hehn 1971, p. 344–373. ^ Bokovoy, Irvine & Lilly 1997, p. 322. ^ "Slobodan Milosevic Biography". www.BookRags.com. Archived from the original on 9 April 2011. ^ "Context of 'March 23, 1989 and After: Kosovo Assembly Approves New Serbian Constitution; Unrest Follows'". historycommons.org. Archived from the original on 26 September 2011. ^ "Archived copy" (PDF). Archived (PDF) from the original on 26 May 2011. Retrieved 8 June 2011. CS1 maint: Archived copy as title (link). ^ Charles Recknagel (May 2006). "Montenegro: Independence Referendum Turns Into Cliffhanger". globalsecurity.org. Archived from the original on 11 May 2008. Retrieved 4 March 2008. "For independence of Montenegro, 55.4 percent of citizens have voted. 44.6 percent of citizens have voted for the union state", Frantisek Lipka, a Slovak diplomat heading the referendum commission, announced at a news conference in Podgorica today. ^ "Timeline: Montenegro". BBC News. 26 September 2007. Archived from the original on 8 March 2008. Retrieved 4 March 2008. 2006 June – Montenegro declared independence, Serbia responded by declaring itself the independent sovereign successor state to the Union of Serbia and Montenegro. ^ "Serbia backs draft constitution". BBC. 30 October 2006. Archived from the original on 8 November 2006. Retrieved 30 October 2006. ^ Süddeutsche Zeitung, 12 May 2018. ^ "Serbia applies for EU membership". Swedish Presidency of the European Union. Archived from the original on 26 December 2009. Retrieved 25 December 2009. ^ "EU unfreezes trade agreement with Serbia". Archived from the original on 8 January 2010. Retrieved 25 December 2009. ^ "EU scraps visas for three Balkan states". BBC. 1 December 2009. Archived from the original on 4 December 2009. Retrieved 25 December 2009. ^ "European Commission - PRESS RELEASES - Press release - EU and Serbia: enhanced cooperation rules enter into force". europa.eu. Retrieved 1 October 2018. Constantine VII Porphyrogenitus (1840). De Ceremoniis (Reiske, J. J. ed.). Impensis E. Weberi. Bokovoy, Melissa K.; Irvine, Jill A.; Lilly, Carol S., eds. (1997). State-Society Relations in Yugoslavia, 1945-1992. London: Palgrave Macmillan. Bulić, Dejan (2013). "The Fortifications of the Late Antiquity and the Early Byzantine Period on the Later Territory of the South-Slavic Principalities, and their re-occupation". The World of the Slavs: Studies of the East, West and South Slavs: Civitas, Oppidas, Villas and Archeological Evidence (7th to 11th Centuries AD). Istorijski institut SANU. pp. 137–234. DiNardo, Richard L. (2015). Invasion: The Conquest of Serbia, 1915. Santa Barbara: Praeger. Fryer, Charles (1997). The Destruction of Serbia in 1915. New York: Columbia University Press. Gumz, Jonathan E. (2009). The Resurrection and Collapse of Empire in Habsburg Serbia, 1914-1918. Cambridge: Cambridge University Press. Jireček, Constantin (1911). Geschichte der Serben. 1. Gotha: Perthes. Jireček, Constantin (1918). Geschichte der Serben. 2. Gotha: Perthes. Komatina, Predrag (2010). "The Slavs of the mid-Danube basin and the Bulgarian expansion in the first half of the 9th century" (PDF). Зборник радова Византолошког института. 47: 55–82. Luttwak, Edward N. (2009). The Grand Strategy of the Byzantine Empire. Harvard University Press. Pavlovich, Paul (1989). The History of the Serbian Orthodox Church. Serbian Heritage Books. Petrović, Vladimir P. (2007). "Pre-Roman and Roman Dardania: Historical and Geographical Considerations" (PDF). Balcanica. Balkanološki institut SANU. 37: 7–23. Pisarri, Milovan (2013). "Bulgarian Crimes Against Civilians in Occupied Serbia during the First World War". Balcanica. 44: 357–390. Popović, Svetlana (2001). 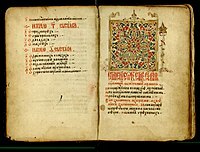 "The Serbian Episcopal sees in the thirteenth century (Српска епископска седишта у XIII веку)". Старинар (51): 171–184. Wikimedia Commons has media related to History of Serbia. Ćorović, Vladimir (2001). "Istorija srpskog naroda". Metohija or Dukagjini ) is a large basin and the name of the region covering the southwestern part of Kosovo. The region covers 35% (3,891 km2) of Kosovo's total area. According to the 2011 census, the population of the region is 700,577. Vojvodina is the Serbian name for the territory in Northern Serbia, consisting of the southern part of the Pannonian Plain, mostly located north from the Danube and Sava rivers.